Stephen W. Terrell's (MUSIC) Web Log: THROWBACK THURSDAY: It's Almost Sammy's Birthday! Only five more shopping days until Sammy Davis, Jr.'s birthday! 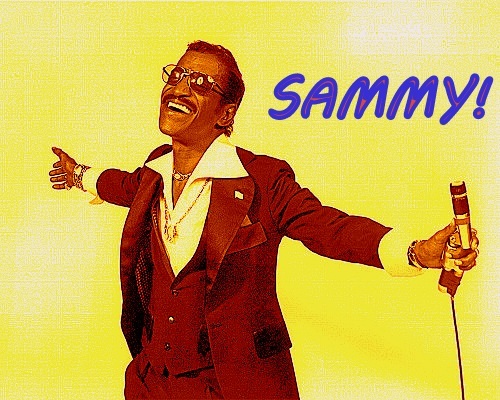 Yes Sammy was born December 8, 1925 in Harlem. He would have been 90 had he lived. You don't know who Sammy was? Sammy did it all, baby. He sang, he danced, he told jokes, he acted in movies, he marched with Martin Luther King, he embraced Richard Nixon, he dabbled in Satanism, he was an OG in the Rat Pack with Frank and Dino. But of course Sammy only got more amazing as he grew older. Here's a starry-eyed song from 1954. At Sammy's funeral in 1990, his longtime pal Jesse Jackson gave the eulogy and frequently told those who loved the man to "let Bojangles rest." And while I respect that thought, a talent like Sammy's never truly rests.